The Tandy 1000 EX is a member of the Tandy 1000 series family. See this entry for more info. The Tandy 1000 EX was designed as an entry-level IBM compatible personal computer designed as a starter system and sold for $1000.00 US by December 1986. The EX was compact with the keyboard and 5.25" drive built into the computer casing; the 5.25" drive accessible from the right hand side of the computer. A 256K PC-compatible computer, ready to use the MS-DOS software you bring home from the office, as well as software designed for the home or classroom. 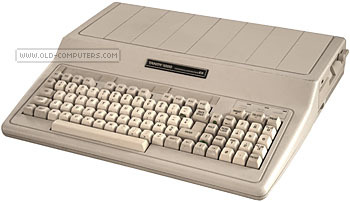 The integral 90-key keyboard has the same layout as the Tandy 1000SX, ideal for business programs. You'll find an advanced three-voice sound circuit for sophisticated sound an music generation through the built-in speaker. There's also a headphone jack with volume control - perfect for the classroom. Graphics-oriented Personal Deskmate software features six programs and handy pull-down menus and pop-up boxes for selecting funvtions. see more Tandy Radio Shack 1000 EX Ebay auctions !